Similar in appearance to dill, fennel (Foeniculum vulgare) is a popular aromatic herb with a variety of health benefits. Fennel seeds are small, slim, elongated, ribbed, green or gray capsule-shaped fruit which look and taste very similar to anise. They are an extremely popular spice throughout the world and can be added to virtually any recipe including salads, pork dishes, biscuits or desserts. Fennel seeds owe their particular flavor and antibacterial properties to a wide range of aromatic oils, but also possess a varied and generous nutritional profile. 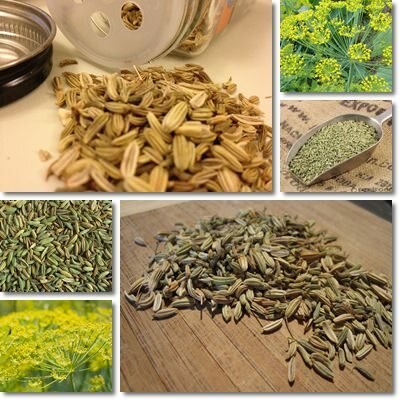 Traditionally, fennel seeds were consumed after meals to freshen one’s breath and to aid digestion. Fennel seeds are a rich source of vitamins, minerals and potent antioxidants with great positive effects on general health. They contain quercetin and kaempferol, two flavonoids with powerful antioxidant properties which combat free radical damage and help prevent infections, degenerative neurological diseases, premature aging and even lower cancer risks. In addition to this, fennel seeds contain almost 40 g of fiber per 100 g of seeds, which is undoubtedly an astonishing amount, close to covering an average adult’s daily fiber requirements. Although you don’t eat nowhere near that much in any given day, and you shouldn’t either, even as little as 5-10 g of seeds can supply a good amount of fiber, enough to our fiber requirements and allow us to enjoy the benefits of a balanced diet. Such an incredibly high fiber content makes fennel seeds an excellent natural laxative, helping relieve constipation naturally. If you are having a hard time with constipation, you could add a few grams of fennel seeds to your daily diet to help increase the frequency of bowel movements. Nuts and seeds in general, as well as cereals, oats especially, are other great options to help you deal with constipation. But remember: increasing your daily fiber intake should be accompanied by an increase in liquid intake because fiber soaks up a lot of water to perform its magic. Furthermore, tea made from fennel seeds is another great solution to relieve constipation. As someone who has fought constipation all of my life, I found the tea extremely helpful for regulating intestinal transit. Such benefits are a result of fennel seeds being a precious source of essential oils such as anethole, limonene, anisic aldehyde, pinene, myrcene, fenchone and cineole, which not only contribute to their unique fragrance and taste, but also provide constipation relief along with a variety of other health benefits. For instance, anethole has been found to have powerful antimicrobial properties, proving effective against Salmonella enterica, a variation of the dangerous Salmonella bacterium. Limonene plays an important part in stress management, but its use is limited to aromatherapy in this case. Myrcene boasts powerful analgesic-sedative as well as anti-inflammatory properties. The essential oils in fennel seeds play a protective role on the digestive system. Eating a few fennel seeds can help absorb intestinal gas and thus reduce flatulence and relieve heartburn. Also, infusions made from fennel seeds, flowers and leaves are recommended for abdominal cramps, colic, bloating, indigestion or parasite infections. Good to know: as healthy as it may be, limit yourselves to one, maybe two-three cups of fennel tea made from fennel flowers because toxicity at the level of the nervous system may occur. There have been reports of people experiencing drowsiness, hallucinations and even epileptic seizures. The same goes if you are allergic to the fennel plant. Pregnant women should avoid fennel and other aromatic herbal tea infusions due to the risk of miscarriage or premature labor. Fennel seeds are extremely rich in B vitamins: niacin, pyridoxine, riboflavin and thiamine ensure nutrients from food are properly absorbed at the intestinal level. Also, thiamine (vitamin B1) helps improve memory and concentration and relieves stress symptoms. Riboflavin (vitamin B2) improves eye health and is efficient against eczema. Fennel seeds also boast generous amounts of vitamin C, a powerful natural anti-inflammatory and antibacterial. Last but not least, fennel seeds are an amazing source of manganese, iron, calcium, copper, magnesium, phosphorus, zinc and potassium. Although they are marketed for their beneficial effects on the digestive system alone, actually fennel seeds have a protective effect on the heart and cardiovascular system as well due to an unmatched potassium content (36%). Zinc (33.5%) makes them ideal for boosting immunity. Iron (232%) energizes the body by ensuring enough oxygen gets to muscles, while calcium (120%) and phosphorus (70%) contribute to strong bones and teeth. When consumed with moderation, fennel seeds can prove an excellent digestion aid. Conclusion. Overall, the seeds are highly efficient in treating gas, bloating, abdominal cramps and helping manage digestive upset. Their essential oil content helps reduce stress and they boast significant antioxidant and anti-inflammatory potential. Personally, I adore fennel seeds. They are the perfect aromatic combination and I find they go extremely well with simple wheat biscuits. Do you eat fennel seeds?